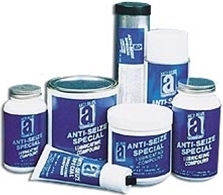 Anti-Seize™ Special is a superior-grade assembly compound and high-pressure lubricant. This aluminum, copper, and graphite based anti-seize formula has unique particle shapes suspended in a special carrier. It protects metal parts under extreme heat, pressure, and contaminating conditions to 2000°F (1095°C). Anti-Seize Special is designed with ultra fine metallic and graphite particles enhancing a longer lasting protective film, resisting washout and burn-off. Meets the performance requirements of MIL-PRF-907F specifications. Applications: All nuts and bolts, bushings, centers, cam rollers, conveyors, couplings, dies, drills, fittings, flanges, gears, keyways, motors, press fits, pumps, shafts, sleeves, slides, spark plugs, taps, valves, wristpins, and more. They are used in steel mills, foundries, oil refineries, chemical plants, construction and farm equipment, autos, trucks (fleet maintenance), electric power and other utilities, oil drilling, mining, diesel and gasoline engines, marine motors, shipyards, paper mills, and machine shops.